I have written three posts on HPs pension fund. I also wrote to HP outlining several of my main concerns. HP filed a 10K and gave me a detailed response to other concerns. They also hired external audit people to check. First observation: A good proportion of the gains were from total return swaps on very long US government bonds. I thought that unlikely - but many of my blog readers (correctly) guessed it. I was wrong. It happens a lot unfortunately. I have written many letters to companies before - most to very dodgy companies. I have never received a response as transparent as HP. Kudos to them. As for Gretchen Tai. Her asset management looks pretty good. Fushi Copperweld - a small cap Chinese stock specializing in bimetallic wire - is going private - purchased by "Green Dynasty" - a vehicle funded by Abax Capital and China Development Bank. 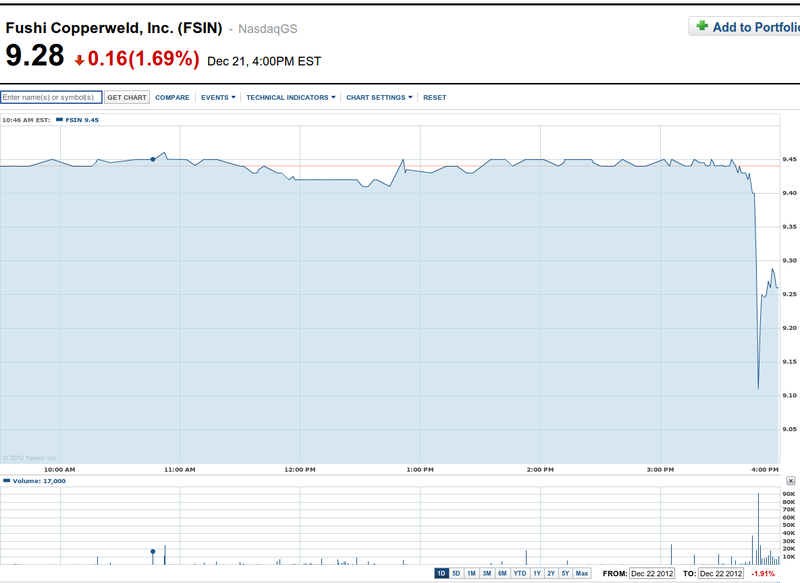 The deal was supposed to close in the week of 11 December 2012 according to a press release filed with the SEC. The following Monday (before market) Fushi released an update regarding the merger. The press release has so far not been filed with the SEC. To quote: "[b]ased on information provided by Green Dynasty, the Company anticipates closing of the transaction by or on Monday, December 24, 2012." If the deal closes it will be a nice Christmas present from the Chinese to various arb funds because this deal has had a fat spread for much of its existence. This transaction has history. It was first proposed by the chairman in November 2010 at $11.50 - but later withdrawn. 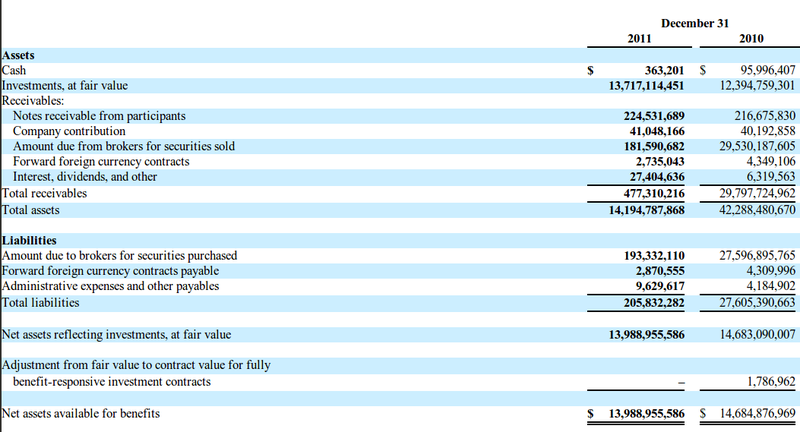 The Chairman came back with a $9.25 offer and revised that offer to $9.50 which was accepted. The stock is not without controversy. Muddy Waters (of Sino Forest fame) has alleged Fushi is a fraud. Bronte was short a small amount well before the Muddy Waters announcement (and shorted the original $11.50 offer) because the accounts were a little unusual. This was a stock on which we won-some, we lost some. Even if the company is a fraud that does not mean the deal will not close. There were credible allegations of fraud against Harbin Electric and the accounts were decidedly funky - but the deal did close and many shorts (including Bronte) received a nastier than usual flogging. Moreover Harbin was taken private by Abax Capital backed by China Development Bank. The same combination taking Fushi private. That I am short again (and in this time in quantity) indicates that I am some kind of masochistic sucker for punishment. There is a theory as to why some Chinese companies with fraudulent accounts were taken private. About a decade ago you could not buy industrial land around Shanghai and other cities unless you had a business to put on that land. So people invented fictional businesses to buy real land. Later they reverse merged those fictional businesses into the US and sold shares in the fictional businesses. In some cases the land appreciated enough to make the stock worthwhile even though the accounts are fictional. I know this to be true in at least one case (a case on which I lost money). I am not sure whether it is true of Harbin but Harbin Electric did own lots of land. There is another reason why Chinese companies are taken private. And that is the operation was originally the children of Chinese elites ripping off Western stock markets (by selling fraudulent stocks). When that no longer worked they had no shame. Now they ripped off Chinese banks by getting them to finance LBOs. I know of at least one fraud run by a child of a central committee member that received a bid from a well connected Chinese private equity fund. The Fushi Copperweld saga is long running. Now it is a simple question of whether the deal will close and today is the day of truth. It is likely to close. It is not over until the fat-lady sings - but she is clearing her throat. When examining situations like this its best to read the boiler plate. The boiler plate in various disclosures has changed recently. There is no financing condition to completion of the merger. Mr. Fu and Abax have secured fully committed debt financing from China Development Bank Corporation Hong Kong Branch to finance the transaction. The press release of 11 December 2012 says that the deal will close "this week" (a week now well and truly past). However it introduces a new paragraph into the boiler-plate forward looking statements. A number of the matters discussed herein that are not historical or current facts deal with potential future circumstances and developments, in particular, whether and when the transactions contemplated by the Merger Agreement will be consummated. The discussion of such matters is qualified by the inherent risks and uncertainties surrounding future expectations generally and also may materially differ from actual future experience involving any one or more of such matters. Such risks and uncertainties include: any conditions imposed on the parties in connection with consummation of the transactions described herein; satisfaction of various other conditions to the closing of the transactions described herein; and the risks that are described from time to time in the Company's reports filed with the SEC. 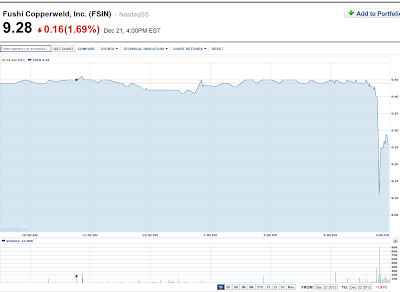 "As previously announced, on December 11, 2012, the Company's stockholders approved the Merger Agreement. Green Dynasty has advised the Company that it is in the process of effecting the satisfaction of all conditions to draw all necessary funds pursuant to the facility agreement with the China Development Bank in order to consummate the proposed merger. Based on information provided by Green Dynasty, the Company anticipates closing of the transaction by or on Monday, December 24, 2012." "Effecting the satisfaction of all conditions necessary to draw all necessary funds" is a somewhat weaker statement than "there is no financing condition to completion of the merger". All I can say for the arb funds involved. This better close. Or you are holding a very weak hand indeed. But then I have never seen a deal fail so near the line. It should close and by close of business today the stock will have disappeared and shareholders will be entitled to receive $9.50 per share from the clearing corporation. And I will have lost a few pennies on my short (just in time for Christmas). Whatever happens - I hope you all have a merry and safe Christmas (or festive season if Christmas is not your thing). I have just been sent a list of the total return swaps in the Master Trust for the HP Pension Plan. 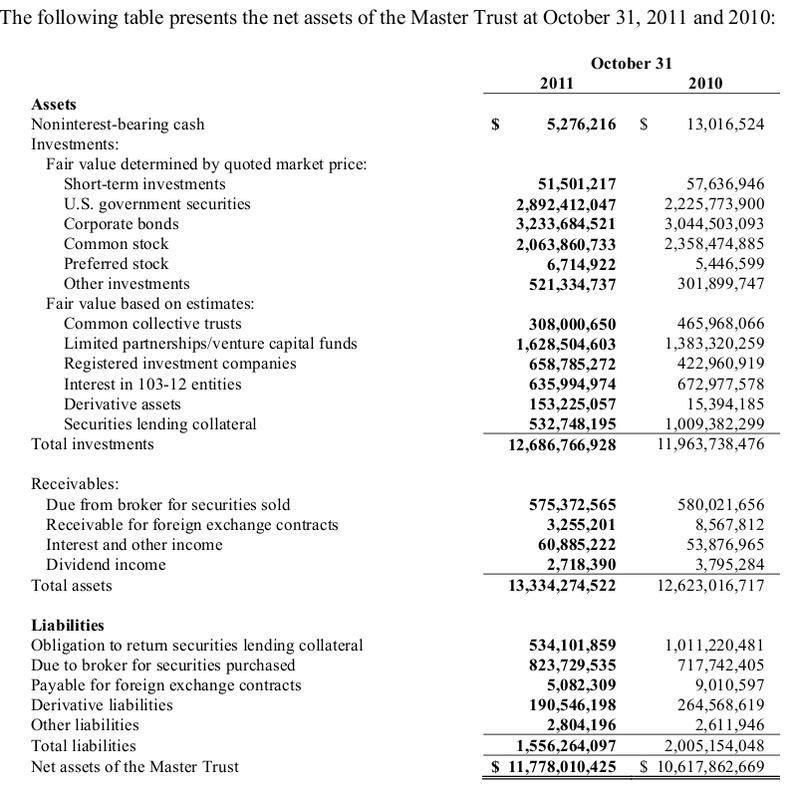 These TRS (standing for Total Return Swaps) were interlaced with tens of pages of other assets and not in the pension plan form 5500 but in the (separate) Master Trust form 5500. They are all returns for the very long bond (entirely Barclays 20 plus year index). The current value of these bears no resemblance to how profitable the position appears to have been in aggregate or how profitable it would have been over 12 months. The 20+ Barclays index returned high teens percent during the year until October 2011 - which is consistent with the results achieved. The 2011 results are thus mostly explained by a huge derivative position on the long bond as several of the commentators guessed. Strangely the fund also carried interest rate swaps (separately disclosed) on which they lost money. That said, the HP Pension Fund got almost entirely out of equities in 2007 and almost entirely into long bonds (via swaps) just as the yields collapsed. The former was disclosed contemporaneously. The latter was not disclosed. The result is impressive: at minimum a very well timed form of liability driven investing. In my last post I detailed the very fine performance by Gretchen Tai, the asset manager for the Hewlett Packard defined benefit fund. I was trying to work out how it was achieved. Being ignorant in these matters I did not even know the defined benefit fund had to file detailed accounts at the Department of Labor on form 5500. My readers are smarter than me. So they pointed me the right direction. Now we can work out in much greater detail how the returns were made. Its pretty clear. There are $2.9 billion in US Government Securities, $3.2 billion in corporate bonds, $2.1 billion in common stock as well as a whole lot of other things ($0.3 billion in common collective trusts, $1.6 billion in limited partnerships and venture capital funds, $0.7 billion in registered investment companies, $0.6 billion in 103-12 entities and some derivative assets). There is also some securities lending collateral which they are obliged to return. 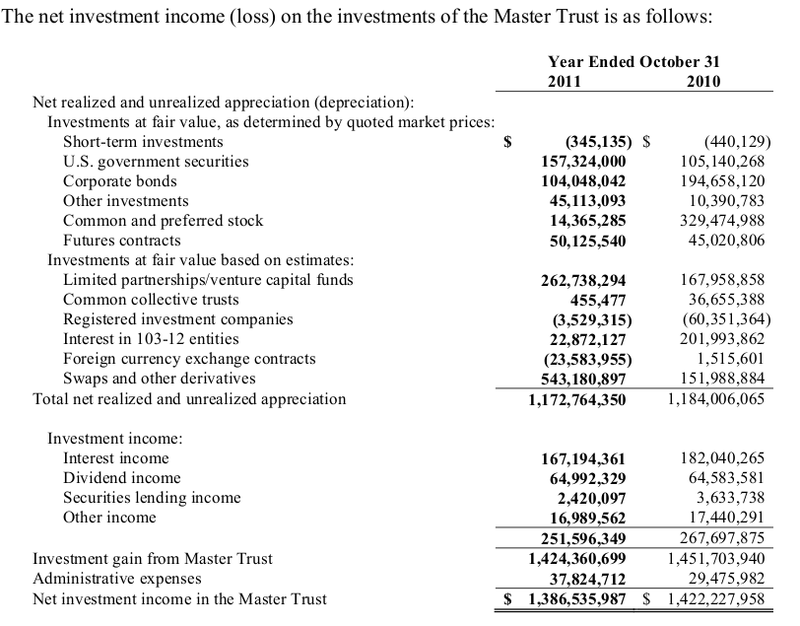 The next page gives net income for the Master Trust by category. We know now the government bonds appreciated by 157 million, the corporate bonds by 104 million and interest was earned of 167 million. 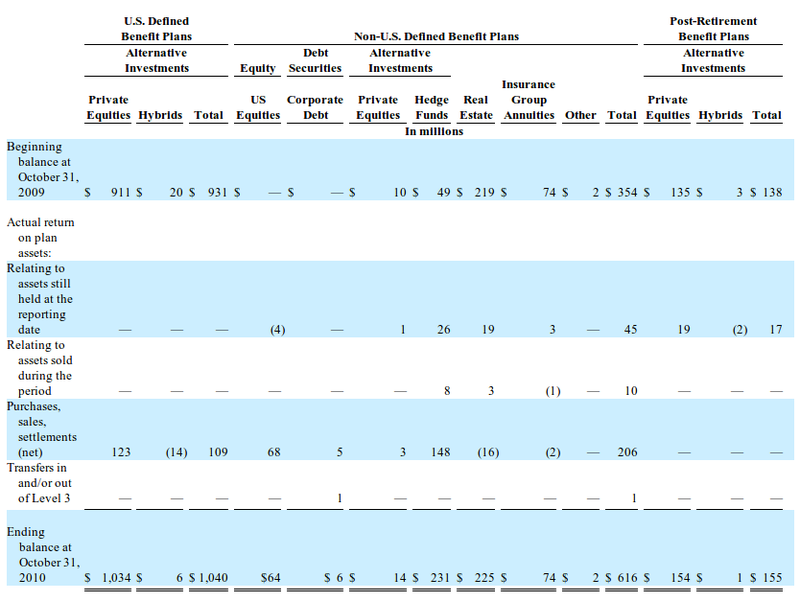 That appears to be the bulk of the return on the $6125 million bond portfolio. That is about 7 percent - roughly the return I might have expected from a diversified bond portfolio provided they held some duration. Much better returns are obtained from the limited partnerships and venture capital funds. They had a return of 263 million on 1383 million in starting capital. That is a very sweet 19 percent. Gretchen Tai chose funds well. But the eye-popping number is the return of $543 million in swaps and other derivatives. This is after a more modest 152 million gain. This woman swaps cash flows amazingly well. There is $2.8 billion up from $2.5 billion in total return swaps. They are also kind enough to tell us the P&L for each of these types of derivatives (none of which are designated as hedges and hence all of which are marked to market). Those total return swaps made $561 million - 22 percent return on the starting derivative asset. Its pure alpha too - the fund needs to pay out the return on the (similar sized) liability they swapped. And so now we know at least of part of Gretchen Tai's secret. She is the wickedest, meanest and most effective trader of total return swaps I have ever seen. A good proportion of my readers would want to hire her immediately. Please note: much to my surprise these returns are entirely genuine. I was originally skeptical. I am now convinced. Whilst I was looking for funded status what caught my eye were the very fine returns they had on assets - particularly in the US defined benefit fund - and particularly over the past three years. I can't quite work out how they do it. I tried to compare the fund to other large endowments (Harvard) and also very large similar pension funds (Ford). This comparison is made harder because Harvard and Yale have 30 June balance dates, Ford has a year-end balance date and Hewlett Packard has an end of October balance date. This difference in balance date is particularly important for the 2009 year which includes more of the crisis and less of the bounce for October balancing funds than December balancing funds. I would love to go further back - when doing this analysis - but it is a little hard. 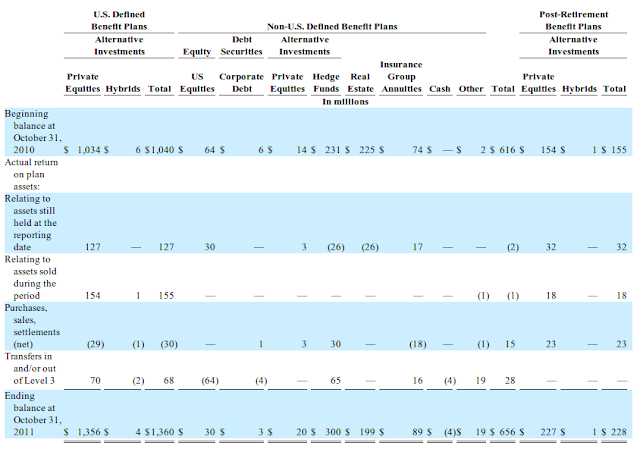 The size of the asset pool roughly doubled in August 2008 when Hewlett Packard acquired EDS and combined the asset-pool for their defined benefit funds. 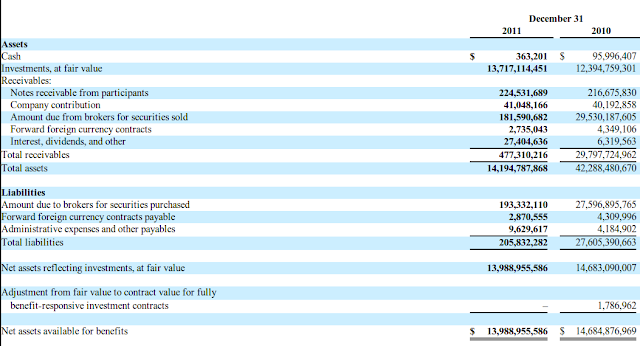 This post goes through the various HP Form 10Ks and various press articles quoting the Chief Investment Officer (Gretchen Tai) and tries to piece together how they do it. This disclosure reveals the US Defined Benefit Plan made $1509 million in profit on starting fair value in assets of $7313 million . That is 20.63 percent. Given the fund paid out $506 million in benefits and settlements the returns for that year were - money weighted - probably nearer to 21 percent. From October to early March the year was not fun either. Then the market bounced with a ferocity that only happens when the consensus is almost entirely hopeless. There is a limited disclosure on how the money was invested. This is a fairly conventional 60-40 split - with 40 percent in equities and 60 percent in public debt securities. There was a small amount of cash. The equities included 10.9 percent allocated to private equity funds. If you are going to get returns of 20 percent out of a diversified 60 percent bonds, 40 percent equities portfolio in this year it is going to have to be roughly one half in non-US equities (thus benefiting from that 30 plus percent return in non-US equities). The bonds are going to have be exclusively in beaten up junk bonds and beaten up corporates. The returns however are not impossible. There were a few indices that performed even better. For instance emerging market debt returned just shy of 40 percent in that twelve month period and the MSCI emerging market equity index was up 64 percent. But those things were badly beaten up in the crisis. A 21 percent return in the year to October 2009 on a huge sum required the calm rationality to buy the really cheap stuff when everyone is panicking. It speaks to Gretchen Tai's calm excellence. The 2010 returns are not as spectacular (you can't get 21 percent every year) but they are extremely impressive. The key disclosure as to the returns (from the relevant 10K) is here. 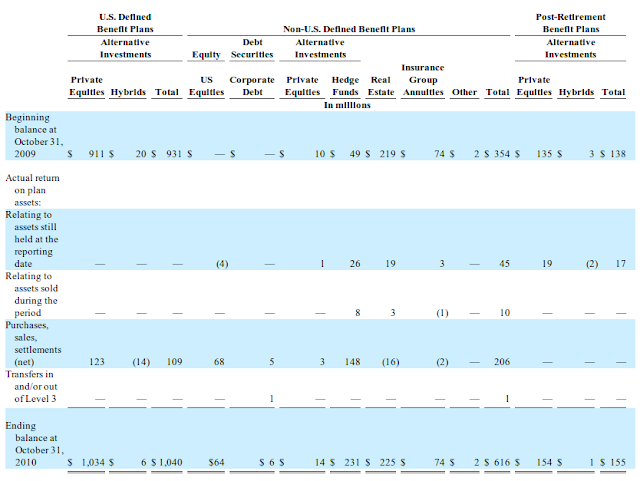 The returns were $1224 million on starting capital of $8371 million. That is a more modest 14.6 percent. The book again targeted a 60 percent bonds, 40 percent equity mix. They had just shy of 40 percent equities but they also held roughly 5 percent in cash at year end. For the first time there is disclosure on the private equity securities they hold. The fund contains "level 3" assets. It worried me that the good returns were from mark-to-myth accounting - but it seems not. During that year they booked zero gains on the level 3 assets. Indeed there was a detailed disclosure. Indeed given that we know how many level 3 assets were held its useful to work out the returns on non-level 3 assets. There were $7440 million in non-level 3 assets at the beginning of the year (8371-931). All the returns - $1224 million - were on these. That is a 16.5 percent return on the non-level 3 assets. As there were net withdrawals from the fund over the year the money-weighted returns were even higher. Against this 16.5 percent is very impressive. There must have been some mighty nice picking. Again a big overweight position in emerging markets would help. Emerging market debt put on another 17.7 percent and the MSCI emerging market index put on almost 24 percent. Whist the Barclays high yield index was not impressive (7.6 percent) some bond indices did better (there were very high returns for some long dated inflation adjusted bonds for instance). As a rule persistence in ownership of the things most beaten up in the crisis (emerging markets, deeply discounted junk bonds) was one way of getting these returns. The 2010 form 10K gives - for the first time - a more detailed breakdown of assets. The portfolio is more balanced than the returns suggest. They do own some non-US market equities but they do not disclose what proportion are "emerging market" equities. They also own a lot of corporate bonds and do not disclose what proportion are emerging market bonds. Whatever - on this sort of portfolio the returns are very fine indeed. The returns were $1389 million on $9427 million or 14.7 percent. In this we see that 282 million of gains came from Level 3 assets - 155 of that from assets actually disposed of (so they were gains received in cash). The starting level 3 assets were 1040 million. 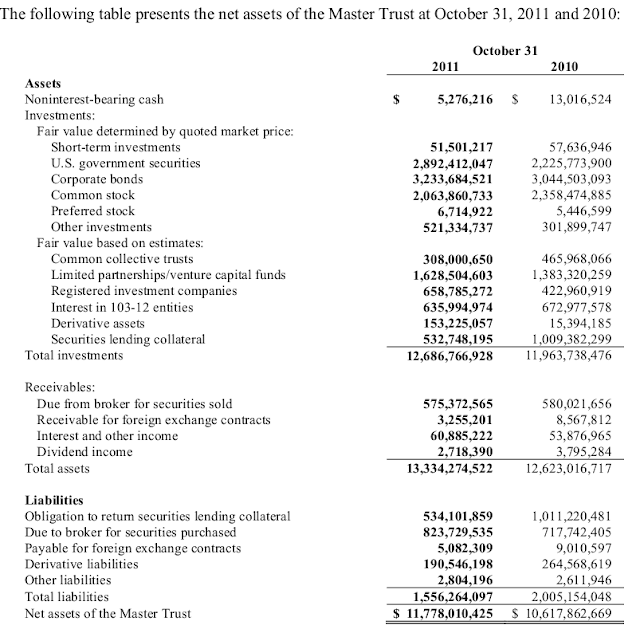 So net of level 3 assets the fund gained $1107 million (1389 - 282) on $8387 million (9427-1040) of assets. That is a return of 13.2 percent. Again this compares exceptionally favourably to the relevant indices. To get these sort of numbers your portfolio needs to be full of very long-dated bonds. This was after all the year that the long-end yield collapsed. Moreover the best returns from the previous two years were in emerging markets. They were not good in the year to October 2011. The bonds scored 4 percent but the equities were -7. The asset mix (also disclosed in the 10K) was not much changed. There is so much alpha generated in these three years I would create insane jealousy amongst my readers if I were to calculate it. But if a masochist wants to work it out (and hence make themselves feel inadequate) go right ahead. In the beginning of fiscal 2008, we implemented a liability-driven investment strategy for the U.S. defined benefit pension plan, which will be frozen by December 31, 2007 and is currently overfunded. As part of the strategy, we have transitioned our equity allocation to predominantly fixed income assets. The expected return on the plan assets, used in calculating the net benefit cost, has been reduced from 8.3% to 6.3% for fiscal 2008 to reflect the changes in our asset allocation policy. Our medical cost trend assumptions are developed based on historical cost data, the near-term outlook and an assessment of likely long-term trends. Actual results that differ from our assumptions are accumulated and are amortized generally over the estimated future working life of the plan participants. "To be honest, we weren’t timing the market. HP had decided to freeze the U.S. DB plan, which at the time was 106% funded and, as a result, we decided with our senior management that an immunization strategy was the right strategy going forward even with pension expense considerations; so, in November 2007, we decided to move out of public equities and into fixed-income and hedged out interest-rate exposure 100%. Although it wasn’t our main consideration, timing of the strategy was fortunate: We were not only able to maintain our funding status through the financial crisis, but also it improved significantly due to strong returns from fixed-income portfolios as well as the interest-rate hedges. How does Gretchen Tai do it? We also manage the company’s DC plan. HP again is being really progressive here. Marketwide, defined benefit plan returns are so much better than defined contribution returns in historical performance—mostly because you have professionals looking after DB assets, and not looking after DC plans. With $15 billion in U.S. 401(k) assets, however, we really want a fresh eye on the plan—we want it to be world class. To do this, we’ve tried to eliminate mutual funds from the investment options, to lower fees. You won’t see brand name mutual funds in our plans—we want participants to focus much more on asset allocation decisions than picking mutual fund managers. Because our plan is so large, we often can use a custom fund-of-funds approach for each offering—which allows our participants to get the benefits of diversification without doing a lot of work." HP officials spent the time in between not only analyzing the elements of both DC plans but also developing a strategy to reduce costs, consolidate record keepers and reduce redundant options. HP has achieved “significant savings” by consolidating providers and using the combined plan's size to negotiate lower fees, said Ms. Tai, who declined to quantify the savings. For some investment options, Ms. Tai said HP uses the same managers for its DC plan as its defined benefit plan, but she declined to identify the managers or the assets they manage. It is a pity she "declined to identify the managers or the assets they manage". I am sure many of my readers would love to know how to find asset managers like that. However the defined contribution plan publishes a form 11-K - which details the portfolio and the returns on it. Unfortunately that has a December balance date and so the numbers are not strictly comparable. 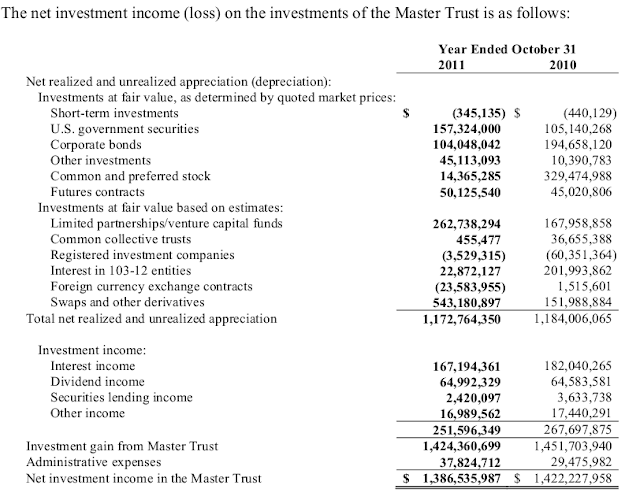 We have $558 million of negative returns on $14195 million of starting assets. That is roughly minus 3.9 percent. There are a few obvious differences. The defined contribution fund contained $561 million in Hewlett Packard shares which were a very poor performer. They moved from roughly $42 to roughly $27. That alone would account for roughly half the loss - but can't account for anything like the difference in performance. The difference in balance date clearly accounts for much more. For instance the S&P returns for the year until October 2011 were 8.1 percent. They were only 2.1 percent in the year until December. The 20 year bond was 15.4 percent in the year until October. It was 28.8 percent in the year until December. Lower equity returns clearly matter as the defined contribution fund was carrying 4 billion in direct equity investments (a very long list indeed) and another few billion in indirect equities (mostly index funds). The higher long-bond returns clearly don't matter much as the fund is strangely bereft of long bonds - carrying huge amounts of mortgaged backed paper (mostly Fannies, Freddies, Ginnies etc). In other words the defined contribution fund was not as well positioned as the defined benefit funds and did not perform as well, and I can't use the defined contribution fund to solve the question of how Gretchen Tai does it. In that year Ford produced $4855 million on starting assets of $37381 million or 13.1 percent. That is a long way below the 20.6 percent produced by Hewlett Packard in their 2009 year. Moreover Ford had the advantage this year of a December year end (and thus includes less of the crisis and more of the recovery in their numbers). This advantage is offset by the very weak long bond at the end of calendar 2009 as the money-printing inflation fear was peaking. That is about 45 percent equities - slightly more than HP - which should be favourable to returns because equities were the better performing asset class. Equities gave 30ish percent (depending on the percentage that was foreign), junk bonds about 20 percent, corporates about 7 percent and longer treasuries were sharply negative the Ford return of 13 percent seems about right. Nothing special - but certainly not bad. Starting assets were $38457 million and actual returns were $5,115 million. That is 13.3 percent. In this case some of the returns are attributed to gains on Level 3 assets. 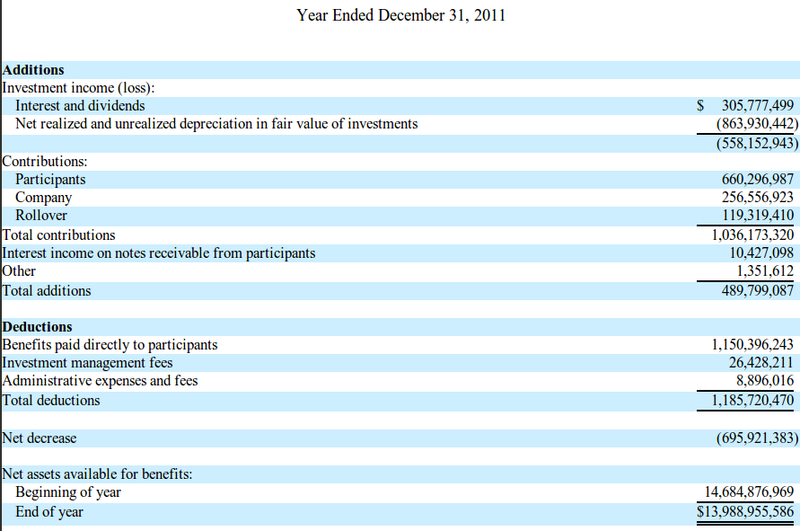 There is a table of these which shows that at the beginning of 2010 there were $3719 in level 3 assets. The gains on these were 522 of gains on them . Net of this the portfolio produced $4593 million (5115-522) in gains on $34738 million (38457-3719) in assets. That is still a respectable 13.2 percent. However you could still get 20 plus percent returns out of emerging markets during that time. The 2011 returns for Ford are more modest. The usual table from the 10K shows $2887 million in gains on $39960 in starting assets for the US fund - a fairly modest 7.2 percent. If you avoided global equities and were long some duration you did well that year. Pension funds are naturally long duration. That said Ford's performance was within the expected range (maybe light if you expected them to hold duration). 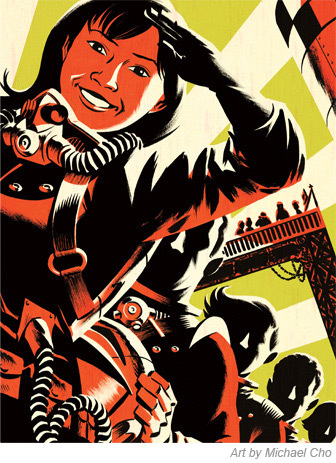 Gretchen Tai and Hewlett Packard perform much better than you would expect given the diversity of their portfolio. Gretchen Tai really is one of the great undiscovered asset managers. I am looking forward to the filing of another Hewlett Packard form 10K (due within days) to find out what Ms Tai has been up to this year.